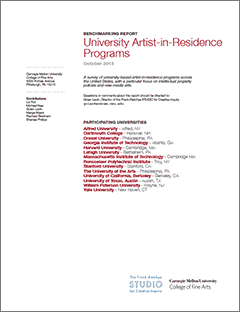 This document presents a benchmarking survey of university-based artist-in-residence programs across the United States, with a particular focus on issues related to intellectual property policies and research in the field(s) of new-media arts. DOWNLOAD THE REPORT (1Mb PDF). In Spring 2013, Carnegie Mellon University’s College of Fine Arts established a committee to benchmark academic artist-in-residence (AIR) programs similar to that of the Frank-Ratchye STUDIO for Creative Inquiry, in an effort to evaluate CMU’s own administrative processes. Our committee selected 14 universities and colleges with comparable artist-in-residence programs and interviewed their program directors and administrators about their practices. The goal of the committee was to design an AIR program which could serve as a “gold standard,” combining the best aspects of all programs studied. Participating universities included: Alfred University, Dartmouth College, Drexel University, Georgia Institute of Technology, Harvard University, Lehigh University, Massachusetts Institute of Technology, Rensselaer Polytechnic Institute, Stanford University, The University of the Arts, University of California at Berkeley, University of Texas at Austin, William Paterson University, and Yale University. Contributors: Liz Fox, Michael Nee, Golan Levin, Marge Myers, Rachael Swetnam, and Shanae Phillips.